Telecom Quality Issues: Facing network issue with Vodafone, Airtel, Idea, & Reliance Jio? 4th June 2018, New DelhiThe telecom war in India is heating up. India has one of the lowest telecom tariffs in the world and with new entrants, new benchmarks are sure to be set. But apparently, lower tariffs do not guarantee good call quality and many consumers have reported issues with their call clarity, voice breaks and call drops. Recently, many consumers have reported major issues, saying that many of their calls do not connect even on multiple tries. 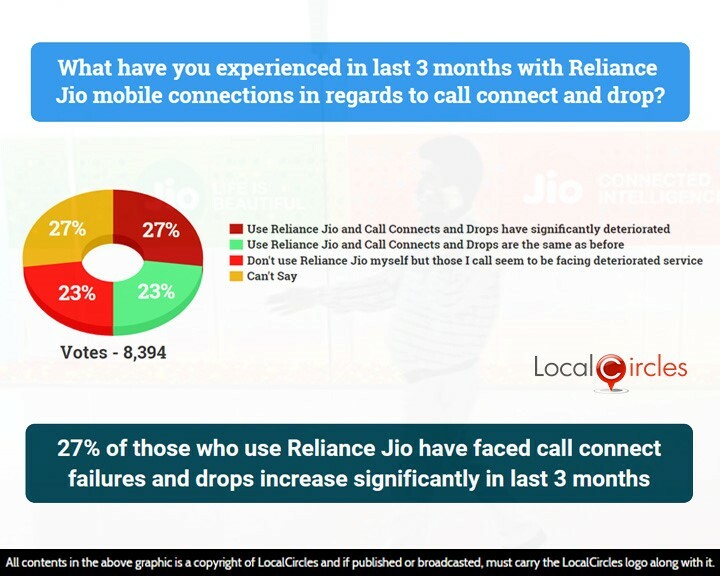 LocalCircles conducted detailed surveys to ascertain consumer perception when it came to call drops and call clarity across the country and polls were conducted across 200 districts in India. 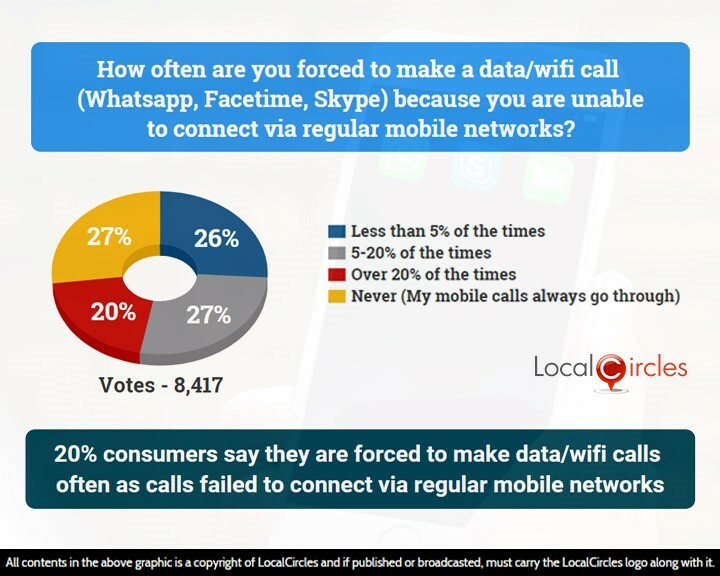 The first poll asked citizens how often are they forced to make a data/wifi call (WhatsApp, Facetime, Skype etc.) because they are unable to connect via regular mobile networks. 20% said they do it more than 20% of the times. 27% said they do it 5-20% of the times while 26% do it less than 5% of the times. 27% said their mobile calls always go through. The second poll asked what percentage of their mobile call drop or have a connection issue. 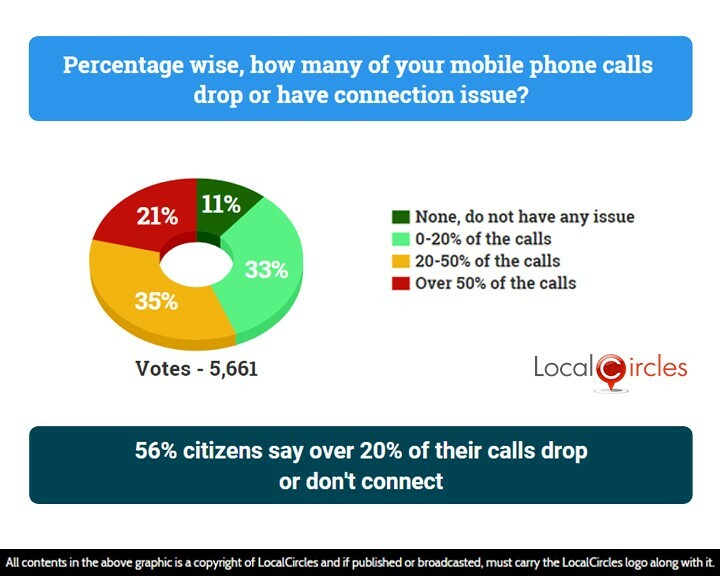 In response, 21% said over 50% of their calls have issues, 35% said 20-50% of their calls have issues, 33% said up to 20% of their calls have connection issues whereas only 11% said they do not face any issues. A call drop represents the telecom service provider’s inability to keep an incoming or outgoing call going. The instances of us rushing from one room to another to get better mobile signals when we receive a call on our mobile phone are quite common. TRAI had last year issued stringent rules for telecom companies who fail to meet voice quality benchmarks. This rule also prescribed a maximum penalty of up to Rs10 lakh per circle. Recently, Telecom Regulatory Authority of India issued notices to various telecom operators of the country on them being compliant to the latest call drop norms set by TRAI. 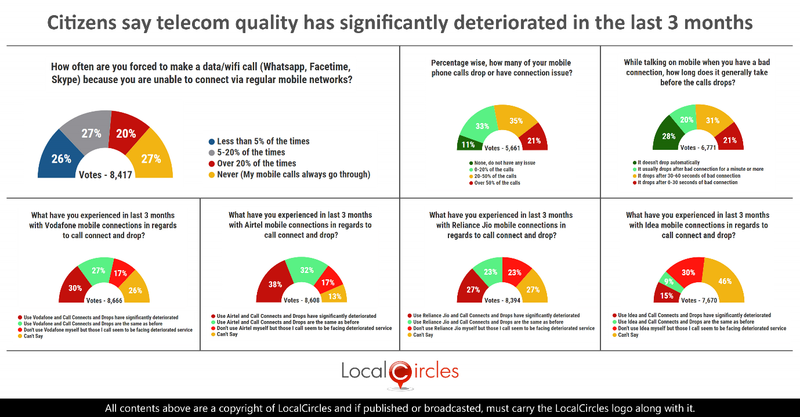 LocalCircles asked citizens about what they have experienced in the last 3 months with various mobile service providers in regard to call connect and call drop. Almost 8000 votes came in on each of these polls. The results are stated below. 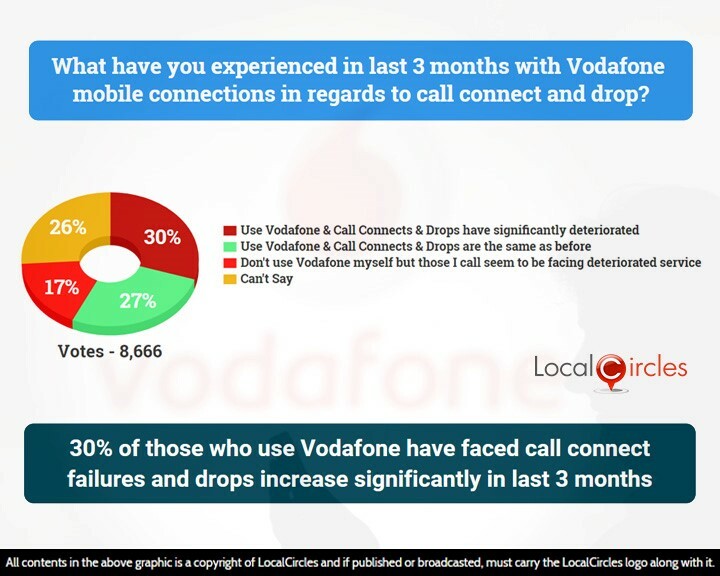 30% respondents who were Vodafone users said that the situation with call connects and call drops has significantly deteriorated while 27% said that it is same as before. 17% said they don’t use Vodafone themselves but those they call seem to be facing deteriorated services. 26% were unsure about the issue. When it came to Airtel customers, 38% of those surveyed experienced a major increase in issues with call connects and call drops. 32% said the issues were same as before. 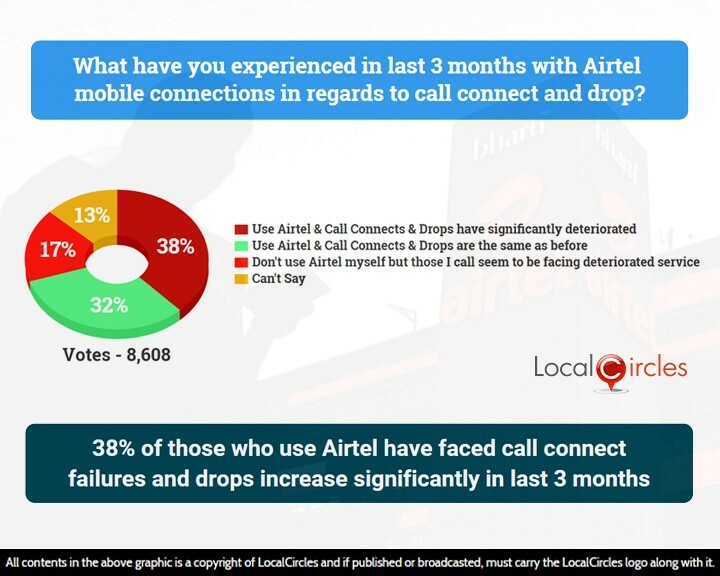 17% said they don’t use Airtel themselves but people whom they call seem to be facing these issues. 13% chose not to answer. Numbers with Reliance Jio were no not much different. 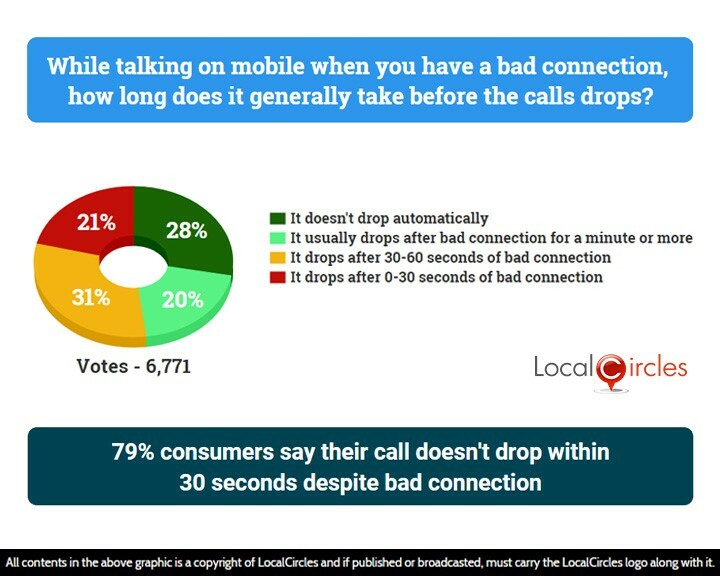 27% said call connects had become difficult and call drops have increased, while 23% said the problem was same as earlier. 23% said they don’t use Jio themselves but people whom they call seem to be having issues. 27m% did not have an opinion on the issue. 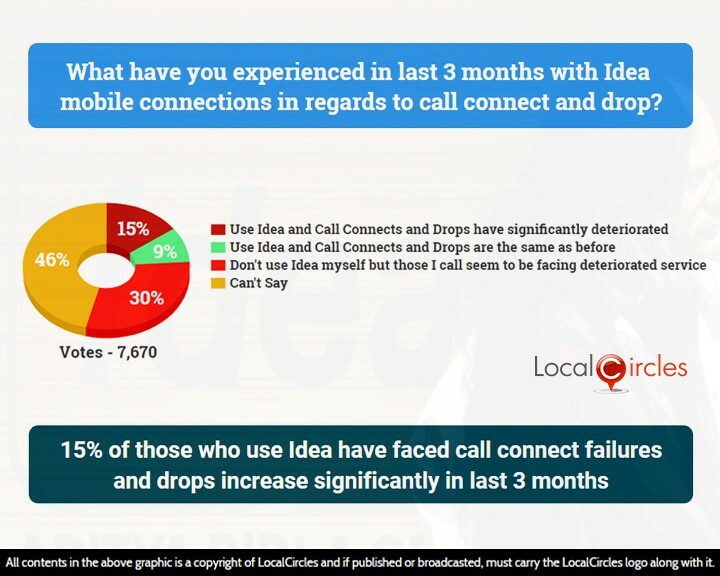 When it came to Idea users, 15% said call connects had become difficult and call drops have increased, while 9% said the problem was same as earlier. 30% said they don’t use Idea themselves but people whom they call seem to be having issues. 46% were unsure about it. In 2015, TRAI had mandated that telecom companies must compensate their users for call drops. The Supreme Court however removed the rule after various carriers appealed. In response to the following poll, 20% citizens said that while talking on the phone when they have a bad connection the call takes more than a minute to drop. 31% said it drops after 30-60 seconds, 21% said it drops within 30 seconds whereas 28% said it does not drop automatically at all. Consumers also said that the call drops faced by them had risen over the past few months as telecom operators moved their network from 2G or 3G to 4G but were not investing enough into their network capacity. Citizens said that telecom companies should ensure optimum quality levels in voice calls and should be held responsible for the plunging service levels. They said that the regulator should also ensure that the issue of call drops and voice breaks are minimised and the telecom operators do not cut corners to reduce prices in order to gain more market share. 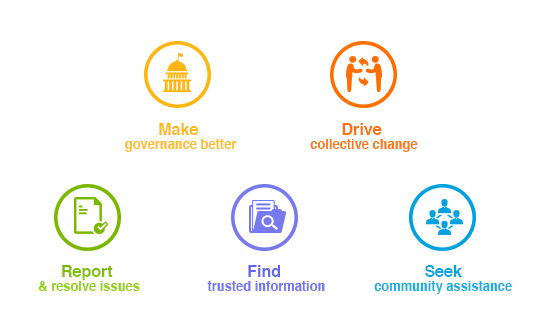 All content in the above graphics in this report are a copyright of LocalCircles and must be used only in the prescribed format. LocalCircles reserves the right to take legal action against any reproduction or redistribution of this content without explicit written approval of LocalCircles.